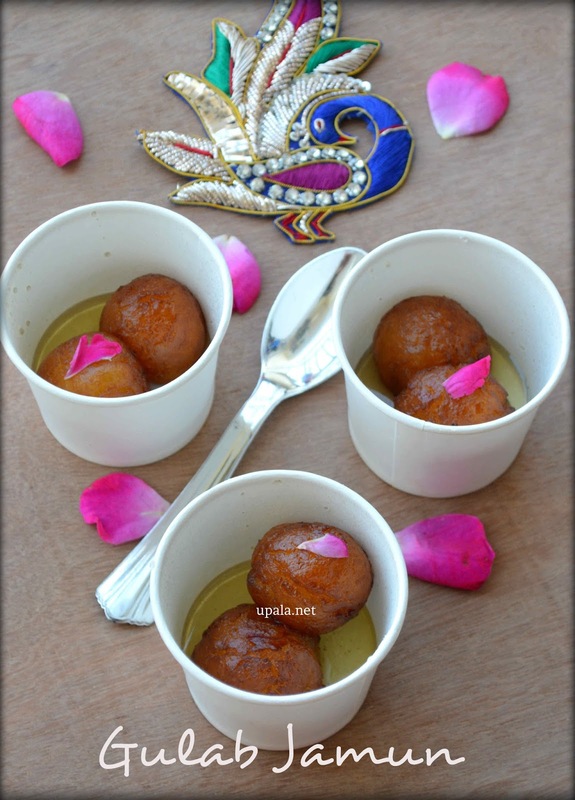 Gulab Jamun is a delicious sweet that melts in our mouth. Pairing hot gulab jamuns with cold ice cream tastes heavenly. Isn't it? Traditionally, Gulab Jamun is prepared from khoya or Mawa but now we are not going to experiment at all. This is an easy recipe using the ready mixes available in the market that will not cost much of your time. I have used MTR Gulab Jamun mix and it was tasting as delicious as it is looking at the picture:). My son is a great fan of Gulab Jamun and would be the first item to order when we go to any restaurant. As I was thinking for a sweet beginning of 2018 for upala, I clicked the pics of Gulab jamun to post it as a first post of the year. Not necessarily be a Diwali or a party to make Gulab Jamun, turn an ordinary day into a special day and surprise your kiddos. 1) Add water and sugar to a deep pan and leave it to boil. 2) Stir the sugar water and when you see that the sugar is dissolved completely, add Saffron and powdered Cardomam. 3) Leave the sugar water to boil and in the meantime, sieve the Gulab Jamun mix to get an even mixture without any lumps. 4) Sprinkle the warm milk and start kneading till you get a soft pliable dough. The dough needs to be a little bit sticky. 5) Cover it and set aside for about 10 minutes. Meantime, check the sugar syrup to see if it has turned slightly sticky and glossy. There is not string consistency that you need to check, once it reaches this slight sticky consistency you can switch off the flame. 6) After 10 minutes, you will be able to see that all the stickiness has gone and will be able to handle it well. 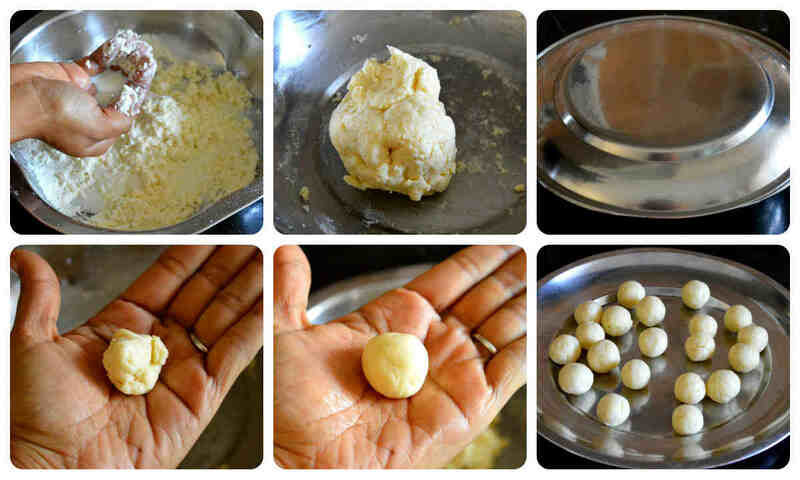 7) Grease your palm with ghee, pinch a gooseberry size ball from the dough and start rolling between your palms gently. 8) You can roll it for few seconds with gentle pressure in order to get smooth balls. Do the same for rest of the dough to form small balls. 9) Heat oil in a frying pan and when it is heated, you can drop one ball to see if it raises immediately. 10) Drop rest of the balls and fry them in batches to till they turn to golden brown in color. 11) Once done, drop the cooked Jamun balls in a paper towel for few seconds. 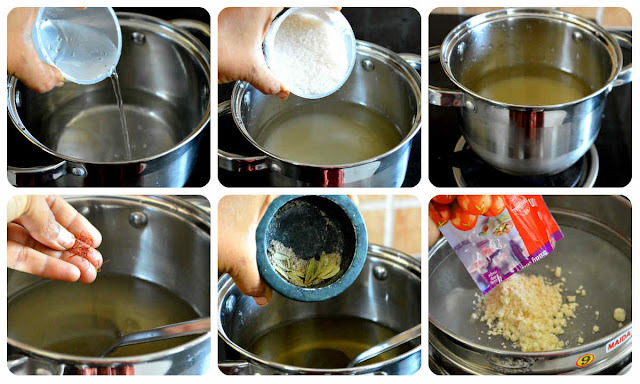 12) Meantime check whether the sugar syrup is warm and if it is cold, boil it for few seconds till it turns warm. 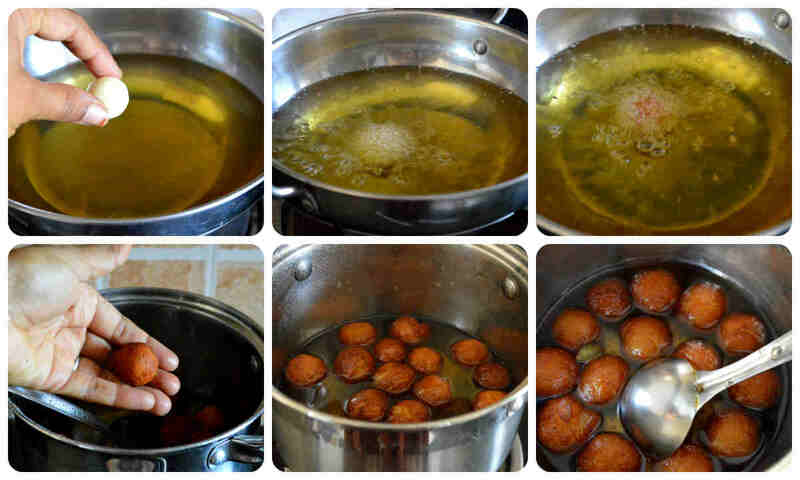 Do this process quickly as leaving the balls to rest for a long time will not yield soft gulab jamuns. 13) Drop the cooked Jamun balls in sugar syrup and leave it to rest for one hour to double up in size. 14) After One hour, yummy Gulab Jamuns are ready to be served. 1) Instead of milk, you can even add water to knead the dough. 2) If the dough has turned out dry, sprinkle milk or water to get the correct consistency. 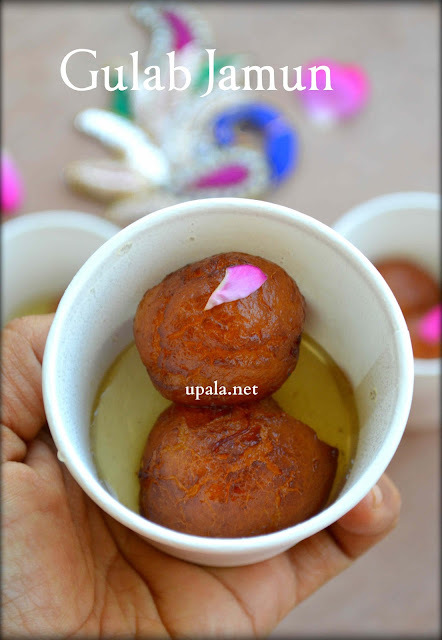 3) While rolling Gulab Jamun dough balls, make sure they are smooth and crack free. 4) Maintain low temperature while frying. In the high flame, they will turn brown quickly with the inner portion left out not being cooked.